Whoever invented the sport of cyclocross had to be a little bit twisted. Clearly, they enjoyed both the demands of cross-country foot races—navigating obstacles with speed and endurance—as well as the distinctive challenges of bicycling in hilly and muddy terrain. Cyclocross requires all of the above, plus a little extra dash of insanity because races normally take place in the fall or winter. 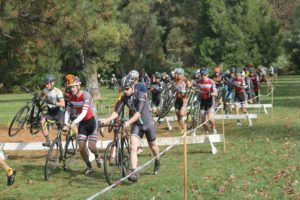 Jacksonville is in the midst of its own five-race cyclocross cyclone, and for the next three Saturdays newbies and experts alike will be tackling the courses cleverly plotted out by organizer Jana Jensen and her crew. A cyclocross course includes everything from steep hills that must be run on foot (the rider throwing their bicycle over their shoulder) to mud pits and barricades. “Whatever we find out on the course, really,” says Jensen. “Sometimes it’s downed trees, sometimes it’s a creek.” One lap of the course covers anywhere from a mile to a mile and a half of distance, and the riders’ goal is to lap as many times as they can in the 35 or 45 minutes allotted them. Jensen’s bike shop, Cycle Analysis, began sponsoring and organizing the races 20 years ago, and at first, she says, it was just a fun way to get the community together. Then Jensen’s son Nicholas got lost in the woods outside Jacksonville. Josephine County Search and Rescue eventually discovered his body in the river. Jensen recalls the primitive nature of the retrieval. Josephine County Search and Rescue, she explains, is a volunteer-run organization. Like search and rescue operations across the state they are mandated but not funded. At the time of Nicholas’ death, the organization lacked such basic equipment as GPS. So, for the past sixteen years, Jensen has been running her Cyclocross races as a fundraiser for this necessary service, in memory of Nicholas. “Over the years we’ve probably donated close to $200,000,” says Jensen. The funds, equipment and training all go directly towards rescuing Josephine County residents and visitors who lose their way while hiking, rafting, and enjoying many of the other outdoor recreation opportunity the area offers. So far, no cyclocross racers have gotten so far off track that Search and Rescue has been called, but many Search and Rescue volunteers do come out to support the event. This year, Jensen says, each race has seen about 80 participants, ranging in age from 8 to 70. The entry fee is $20, and all riders must have a day license to ride, available on-site for $5. Riders under 18 get a free license and entry. Those who prefer the sidelines will have a splendid opportunity to live vicariously, and at the final race on the 19th they’ll eat heartily as well. Volunteers are supplying chili and pumpkin pie, and The Brothers Reed are making an appearance for a special cyclocross concert. 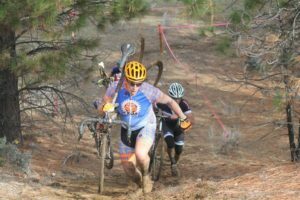 Jensen admits that her cyclocross race is not as competitive as some of the others in the region, but that just might be the secret to the popularity of the Outlaw Series.